Safety is part of the I-4 Ultimate culture and always comes first. That means safety will never be compromised by cost or schedule. We want you to make safety a top priority too. Review the materials on these pages to keep you, and others around you, safe while you’re driving on the I-4 corridor during construction. Our team’s culture places the safety of the traveling public and our workers as a top priority. 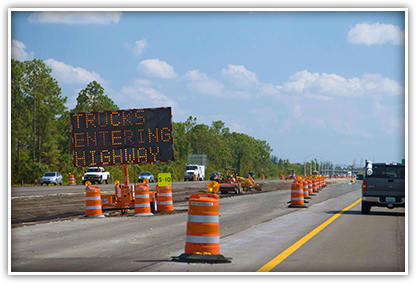 Motorists hold safety in their hands driving through the I-4 Ultimate work zone. Everyone needs to do their part to help reduce crashes and injuries during construction. Here are some tips to make safety for workers, passengers and you the number one priority. Be Alert – Pay attention to the road and your surroundings in the work zone. Don’t Tailgate – Unexpected stops frequently occur in work zones. Allow at least two car lengths between you and the vehicle in front of you. Minimize Distractions – Avoid changing radio stations and using cell phones while driving in the work zone. Dedicate your full attention to the roadway. Expect the Unexpected – Work zones are changing environments. Keep an eye out for workers and their equipment. Don’t Speed – Follow the posted speed limits in and around the work zone. Orange barrels mean pay attention! Please drive carefully in the work zone. Work Zone Speeding: A Costly Mistake. Excessive speed is a factor in more than a third of fatal work zone crashes throughout the state. Remember, crews are working just a few feet from traffic. 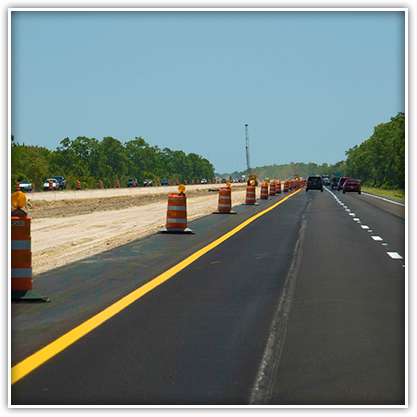 In 2012, there were 51 fatalities, 3,476 serious injuries and 4,677 crashes in Florida work zones. Drivers exceeding the speed limit when workers are present face doubled fines. For example, the penalty for driving 10 mph over the posted speed limit in an active construction zone is $200 plus court costs. The I-4 Ultimate work zones aren’t there to personally inconvenience you. The men and women working to make your future drive better are your friends and neighbors. Just like you they have families they want to go home to at the end of the day. Let them work. Let them live. Safety is a top priority on the I-4 Ultimate project. At the end of the day, we want everyone — workers and commuters alike — to go home to their families and friends. Crews working to build a better I-4 follow Occupational Safety and Health Administration and FDOT safety standards. But drivers are just as responsible for safety in the work zone. Keep reading to find out more about two state of Florida laws — Move It! 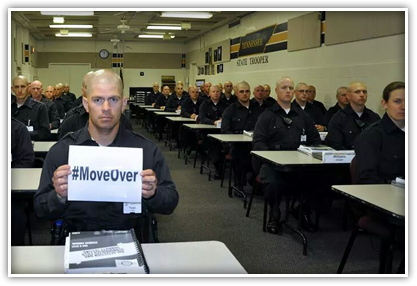 and Move Over — that help enforce safe driving. Urban legend says moving vehicles after an accident takes place is illegal. In reality, the law requires you to move your car off the road! Doing so not only reduces congestion but improves emergency response and clearance times at accident scenes, reduces secondary crashes and improves safety conditions for fire, rescue, police and other responders. Help keep law enforcement officers safe by moving over and away from stopped emergency vehicles. State of Florida Statutes (Sections 316.027, 316.061, 316.063, 316.071) require drivers to make every reasonable effort to move their damaged or disabled vehicle or have it moved so it is not obstructing the flow of traffic. So what should you do if you’re in a minor accident? Assess: Check for injuries. If anyone is injured, call 911 immediately and wait for emergency personnel. Move It…Yes, you can! Determine if the vehicle can be moved. If so, move it off the road and away from traffic. Notify: If no one is injured, call 911 to report the accident and location and follow the dispatcher’s instructions. Report: Exchange driver, vehicle and insurance information. Report the incident as instructed by law enforcement and your insurance provider. For more information on the Move It law, please check out this brochure. More than 800 law enforcement officers have been killed in the line of duty in the last five years. On average, one law enforcement officer is killed every 58 hours. Everyone has a civic duty to reduce this danger by complying with our traffic laws, including the Move Over law, which requires motorists to move over and away from stopped emergency and service vehicles whenever possible or to slow down to 20 mph below the speed limit. 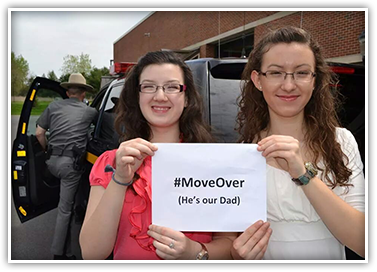 The Move Over law protects our families and friends. Help get them home safely by following the law. Slow to a speed that is 20 mph less than the posted speed limit on a two-lane roadway. Slow to 5 mph if the speed limit is 20 mph or less. Vacate the lane closest to any emergency or law enforcement vehicle parked along the roadway, including police cars, ambulances, tow trucks and other responders, on an interstate or roadway with multiple lanes of travel in the same direction. The law was recently changed to include sanitation vehicles like trash collectors and utility service vehicles. If you are not able to safely move over, you must slow to a speed that is 20 mph less than that posted speed limit unless directed otherwise by a law enforcement officer. So what should you do next time you see flashing lights? It’s simple – move over! The I-4 Ultimate service patrol can help drivers with flat tires, overheated engines and empty gas tanks. The service patrol stands ready to assist stranded cars and clear accident scenes. On February 1, 2015, new service patrols started work on I-4 Ultimate. 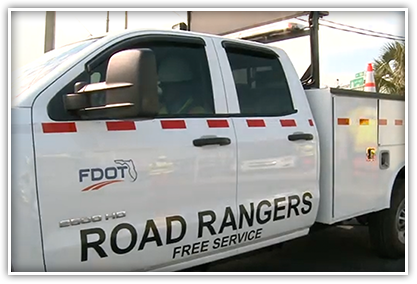 While similar to the Road Rangers drivers are used to seeing, these service patrols are operated by I-4 Mobility Partners — the concessionaire team — and its maintenance provider, Infrastructure Corporation of America (ICA). The service patrols will be responsible for the I-4 Ultimate project limits — from west of Kirkman Road in Orange County to east of State Road 434 in Seminole County. The I-4 Ultimate service patrols are a free service and will respond to all types of incidents. They will provide a direct service to motorists by quickly clearing travel lanes of minor incidents and assisting motorists. Services may include providing a limited amount of fuel, assisting with tire changes and other minor emergency repairs. The service patrol vehicles are stocked with jacks, booster cables, flares and first aid kids. Motorists can call *347 (*FHP) for assistance. In addition to service patrols, ICA will also be responsible for maintenance along the I-4 Ultimate corridor. To report an operations and maintenance issue such as striping or potholes, please call 844-865-2674.